Our series of Basket Stamped Wallets pair fine leather with classic basket styling. 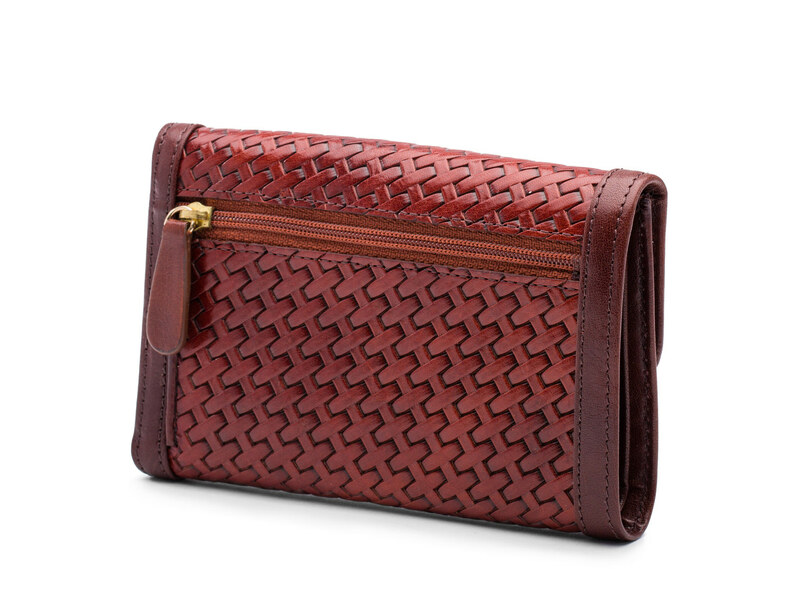 The Beautiful dark auburn leather is embossed with our woven design and crafted into a purse that will last a lifetime. 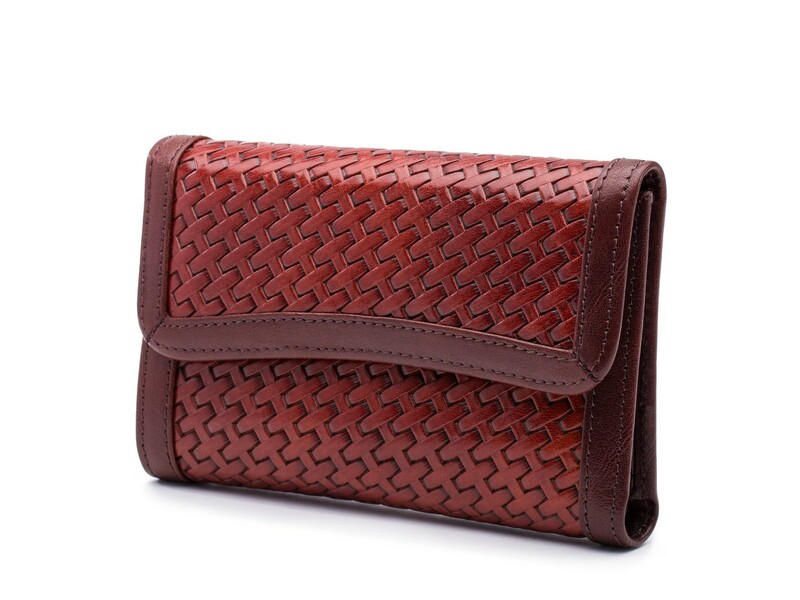 The French Purse is a slender design with beautiful curves making a beautiful women's wallet. Even though the Basket Stampet French Purse has a smaller profile, it has plenty of storage space. There is a total of 7 card slots for all of your credit, membership and loyalty cards. There is a clear ID window making your ID easy to access and show. There are two large vertical pockets which are great for storing receipts and other miscellaneous items. In addition to a cash well for paper money, there is a zippered change pocket on the outside of the wallet. This wallets versatility is matched only by its style. It is the perfect fit for any woman's wardrobe. Our leather wears in, not out. To create a product that gets better with age, we start with the highest quality leather. Bosca leather is made in Italy using primarily natural vegetable tannins. Each hide is individually hand stained with a translucent pigment for a rich coloration. This process showcases the leather’s natural characteristics. Upon completion, each hide is inspected and individually signed to ensure only the best quality. In 1911, a young Italian immigrant named Hugo Bosca founded our company on a foundation dedicated to originality, ingenuity, and lasting quality. Today, the Bosca family and Bosca brand remain stubbornly dedicated to these timeless values. Every detail of each product receives our full consideration from design, to engineering, and, finally, manufacturing. We’re only happy when you’re happy. Many of our customers have fallen in love with our products and have become lifelong Bosca friends. Our goal is to offer you beautiful, durable products that can withstand the impact of hectic daily life. We recognize that sometimes product questions and even the occasional problem can arise. Our hands-on team is small, knowledgeable, and committed to meeting your needs. We're here to help, so give us a call! Why Is Bosca Worth The Price? Every Bosca product is a work of art, handcrafted with over 100 years of experience. Our stubborn dedication to the quality of our leather shows in every product we sell. We use the highest quality leather in the world. Only about 1% of the world's leather supply meets our standards. Learn More... We source our hides from small free-range farms in Europe. Hides with blemishes and scars need to be colored with heavy pigments - covering the natural look and feel of the leather - so we select only the best hides to send to our tannery in Italy. After the tanning process, we inspect the hides for a second time. Color is then applied by hand rubbing translucent dyes into the leather - for this reason we often refer our to leather as hand-stained. We inspect again, looking for flaws and imperfections, but also at the character and coloring of the hide to makesure each one is ideal. We use highly skilled tanning techniques. All leather goes through one of several types of tanning process. We use the method of vegetable tanning as opposed to "chrome" and "synthetic" tanning processes. Learn More... Both processes can leave harmful chemical residuals in the leather. Vegetable tanning uses tannic acids found in plants and some fruits, giving the finished hide a more natural look. We choose vegetable tanning because the leather is know for it's durability and strength. In addition, Veg-tanned leather is an eco-friendly sustainable material and is free of harmful residuals. Vegetable tanning is an Old World skill that blends artistry and precision; thus it cannot be learned overnight. Our tanning partners have three generations of artists, each passing down family recipes only they know. The result is a product that wears in, not out. The real value of a Bosca product shows itself over time. Rather than looking worn and tired it develops a warm, pleasing patina. We regularly see products from customers that are over 20 years old and are even more beautiful than the day we made them. Learn More... We aren't making products that will break down and need to be replaced every two years - we want you to have it for decades. Our products undergo extensive scrutiny. Custom hardware, fabrics, and fittings are chosen to ensure your Bosca piece will hold up to daily use. We have every aspect of production dialed in so precisely that wecontrol the number of stitches in each inch of stitching. We are committed to our products and customers. We know that you'll like your purchase, but we want you to love it. That's why we offer free shipping and 100% free returns within 100 days of purchase. Learn More... We want you to be 100% happy with your purchase, and to feel that your purchase was worth every penny. Shopping online takes away the ability to touch and feel a product. You can't examine the quality and precision, the uniqueness and depth of character unless the product is in front of you.